I believe strongly that one of my roles as Chief is to be involved at the State level through our association, continuing our efforts in the betterment of our profession and support of our members. I wish to continue the good work that we have started this past year in peer support and professional development. 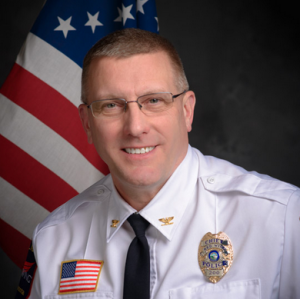 Growing up in Southwest Minnesota, working with agencies in Northwest Minnesota and now as Chief for the City of Red Wing in Southeast Minnesota, I want to continue to be your voice in representing Greater Minnesota on our Board of Directors. Continue our efforts in peer support and professional development of our profession! - Northwestern University, School of Police Staff and Command, Class 229. - Masters in Administration, Human Resources. - Masters in Business Administration. - League of Minnesota Cities, Greater Minnesota Representative to the Criminal and Juvenile Justice Information Advisory Group. - Invited to meet with the Legislative Public Safety Committee Administrator and research staff on firearms background checks.